Producing fibers from basalt was researched during the cold war by the old Soviet Union and limited commercial research and production was done in the U.S. during the same period. The Soviets researched basalt as a source of fiber for ballistic resistant textiles. The price of fibers made from basalt is higher than those made of E-glass, but less than S-glass, aramid or carbon fiber and as worldwide production increases, its cost of production should reduce further. 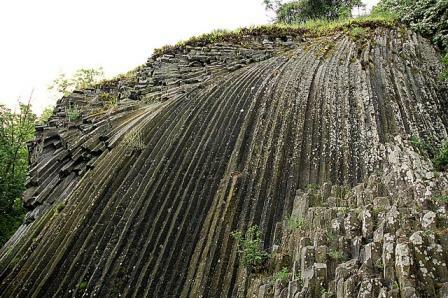 Basalt is a type of igneous rock formed by the rapid cooling of lava at the surface of a planet. It is the most common rock in the Earth’s crust. Basalt rock characteristics vary from the source of lava, cooling rate, and historical exposure to the elements. High quality fibers are made from basalt deposits with uniform chemical makeup. Though the temperature required to produce fibers from basalt is higher than glass, it is reported by some researchers that production of fibers made from basalt requires less energy by due to the uniformity of its heating. Basalt as a fiber used in FRPs and structural composites has high potential and is getting a lot of attention due to its high temperature and abrasion resistance. Compared to FRPs made from glass, aramid and carbon fiber, its use in the civil infrastructure market is very low. Although current research shows that the structural behavior, including long-term deflections due to creep and cyclical loading is similar to glass fiber, internationally recognized code authorities have yet to acknowledge basalt in their codes. This puts the use of basalt at a disadvantage until the American Concrete Institute, Canadian Standards Association, Fédération Internationale du Béton (International Federation for Structural Concrete), and others provide specific design guidance for its use. Recognition and engineering design of basalt composites should continue to climb as research substantiates current knowledge and code authorities adopt its strength characteristics. 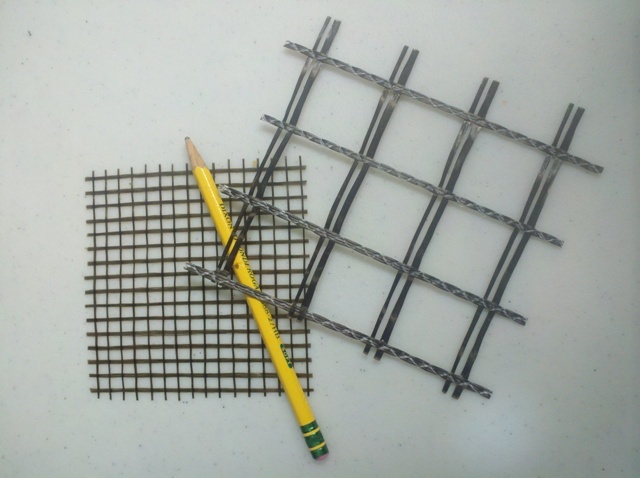 Examples of basalt fiber grids. Hancock, Paul and Skinner, Brian J. "basalt." The Oxford Companion to the Earth. 2000. Encyclopedia.com. “Continuous basalt fiber sector in shaping. (Statistics)” China Chemical Reporter. July 6, 2010. highbeam.com. Palmieri, A., Matthys, S., and Tierens, M. “Basalt fibres: Mechanical properties and applications for concrete structures.” Taylor and Francis Group. 2009. crcnetbase.com.